Please note that route is always the first two digits of your account number. Reference the sample bill below. A one-time 5% penalty is added if payment is not postmarked by the due date as indicated on the invoice. Please note that O’Hara Township adds a 10% penalty to their sewage charges. All others are 5% penalty. Pay your bill online with credit card. Our online payment portal will accept Visa, MasterCard, Discover and American Express. The fee to pay by credit card is $3.00 for every $100.00 charged or portions thereof. The billing service provider that the Authority uses passes the credit card convenience fee directly to the user and the Authority does not receive any part of this fee. As you may be aware, most credit card companies charge the vendor up to 4% when a customer uses a credit card, the vendor then directly passes this cost on to the consumer in the way of higher prices. The Authority feels that this convenience fee is the most equitable way to offer this optional credit card service yet be fair to all customers. If you do not wish to pay the service fee, please consider our Automatic Payment Withdrawal options shown below. Mail your check or money order to us in the envelope provided. Please enclose the upper portion of the bill with your payment and retain the bottom portion for your records. Stop by the Fox Chapel Authority Office. We accept cash, checks, and money orders. There is also a drop-box at the entrance to the office for after-hours payments. Arrange to have your invoice paid automatically each quarter from your checking or savings account. Funds will be withdrawn on the due date from your account. 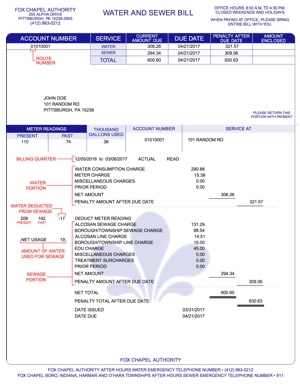 Print the Automatic Bill Payment request form and return the completed form along with a voided check to our office. You will continue to receive an invoice, but it will be highlighted to indicate that payment will be withdrawn on the due date. The owner of the property is responsible for unpaid water and sewage service as they are lienable services when provided by a municipality or municipal authority. We will send the invoice to a property in the name of the owner in care of the tenant. Our system has the capability of sending duplicate invoices to the owner and tenant if desired, or simply phone our office for payment information on your rental property.